So much of what I originally loved about Peter Panzerfaust were the call outs to JM Barre's original vision of Peter Pan. However, eight issues into Image's 25 issue maxi-series it is completely clear that this is more than just a way to scratch that old Peter Pan itch; this is just good comics. Sure, much of the fun in this book comes from the fact that we know these characters and their original interpretations, but what I was really impressed with in this issue was how well Kurtis Wiebe and Tyler Jenkins have crafted this story into a solid, compelling war narrative. Even folks who aren’t too familiar with the Peter Pan mythos can enjoy this book. Solid character interaction with driving intriguing always makes for a satisfying story. Wiebe’s writing has been consistently solid throughout the last few issues of Peter Panzerfaust, but this issue really shines a spotlight on how much talent he really posses. There is some really nifty story telling methods on display in this issue. Wiebe also however, gives his partner Jenkins’ artwork plenty of room to breathe. I was incredibly impressed with the choice in panel layouts. The comic is paced perfectly and flows smoothly. There is a lot of action in these 20 some odd pages, but none of it feels rushed. Instead, readers come away with a very rewarding sense of the exhausted accomplishment our protagonists obviously feel. 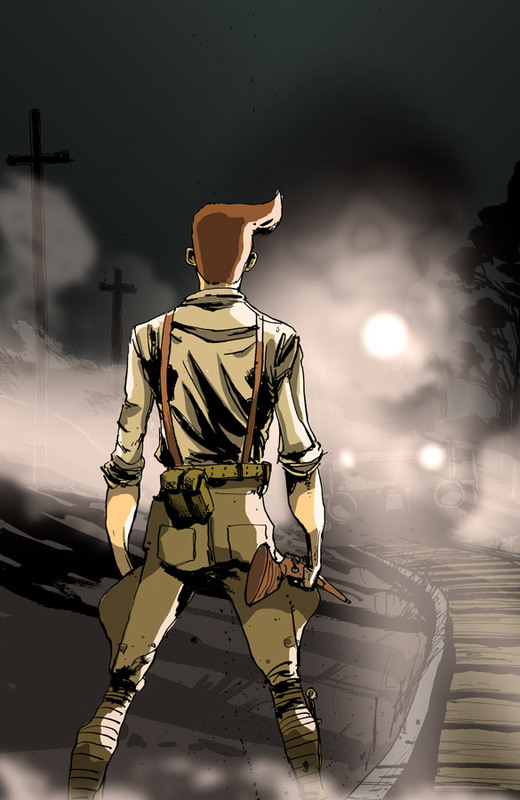 Jenkins’ character design remains one of my favorite things about Peter Panzerfaust. I cannot explain what it is I love so much about his drawings, but his deisgns and his cartooning is among the most original in the industry at the moment. As I previously mentioned, there is a good deal of action in this issue and on every page Jenkins handles it wonderfully. There is a simplicity and deftness to his line that moves the action along wonderfully. While issue eight may not be the best jumping on point for new readers, take this review as a notice: we are a collected edition and a few issues into something really special and this issue only continued that trend. Jump into to one of the most consistent and fun comic books on the stands next month with issue nine.